"Auburn Sky" is a premier cabin in a premier location. 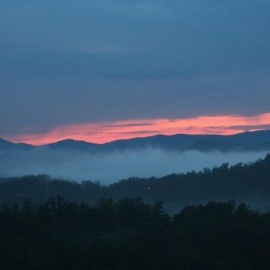 Located less than 8 miles from the center of all the action and attractions of Pigeon Forge you find this cabin is loaded with everything you could ask for on your Smoky Mountain vacation. This cabin is a beautiful 4 bedroom, 3.5 bath with an open floor plan. On the main level you'll find a well equipted kitchen and den with a soaring glass gable wall to take in the incredible view this cabin has to offer. There is a stacked stone fireplace in the den and a breakfast nook that you'll feel like your in a observation room as you enjoy your meal. There is also a deck with rockers and another seperate deck with a patio table and chairs. on this level you will also find a Master Bedroom and bath complete with a Jet Tub and stand up shower. Upstairs there is another bed room and full bath. there is also a loft sitting room with an overlook on the den below and the magnificent view. The lower level of the cabin is packed full with 2 bedrooms, a master bath with a jet tub, and a billiards room. There is also a Hot Tub on the deck that faces the view and when the sun is setting, the "Auburn Sky". 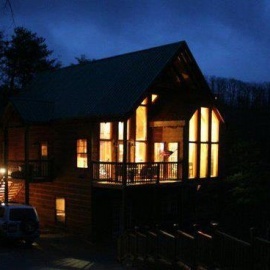 Do yourself a favor and book this cabin for your next Smoky Mountain Getaway.